There were two sections for tonight’s action quads. 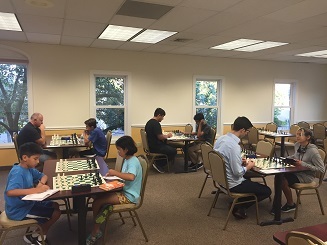 In quad one masters Ian Harris and Alex Eydelman tied for first with 2.5/3 each. The second section was a six player swiss and was won by Justin Blum with a perfect 3/3 score! Beatrice Low and Adriel Alvarado tied for second with 2/3 each. Thank you to everyone that participated. We look forward to seeing you again soon!